In this blog, I talk a lot about Income Generating Asset (IGA). Without passive income from these IGAs, you simply have no means to retire. If you have not allocated high yield bonds in your investment portfolio, you should read on. Many Singaporeans prefer dividend stocks for their retirements, it is a good strategy. The issue is that as you grow older, your risk appetite may drop, your energy level may be lower. Let’s face it, no matter how experienced you are, you don’t want to see your retirement portfolio drop significantly in the event of a stock market crash. 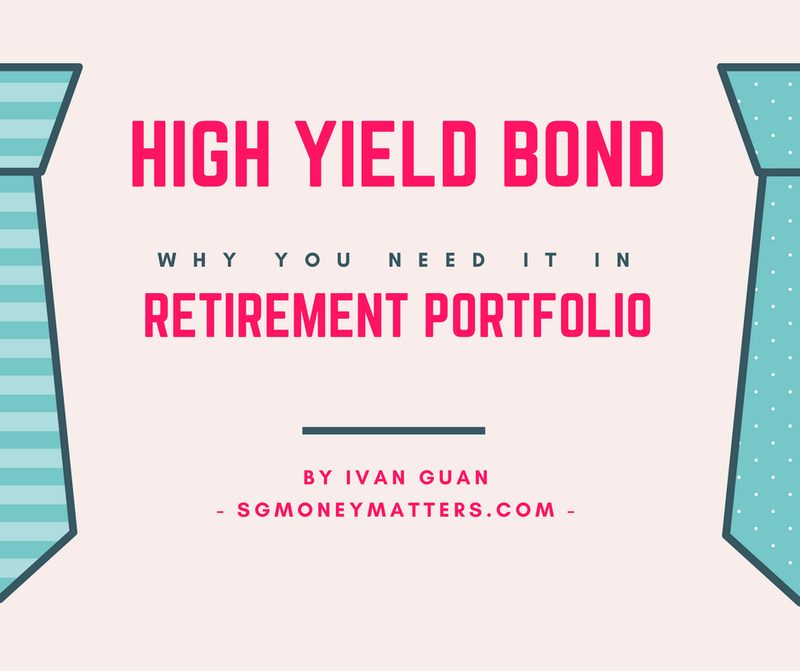 If you want to have better income without taking excessive risks, High Yield bond is an alternative asset class which you need to pay attention to. If you are new to bond investment, you should check out this article I wrote last year. Bond investment, especially High yield bond was a less known asset class to the man on the street in the past. This is because the bond investment was institutional investors’ game, the entry barrier was high. The official definition of a high-yield bond is a high coupon paying bond with a lower credit rating than investment-grade corporate bonds and government bonds, due to the higher risk of default. These bonds carry a rating below “BBB” from S&P and Fitch, and below “Baa” from Moody’s. 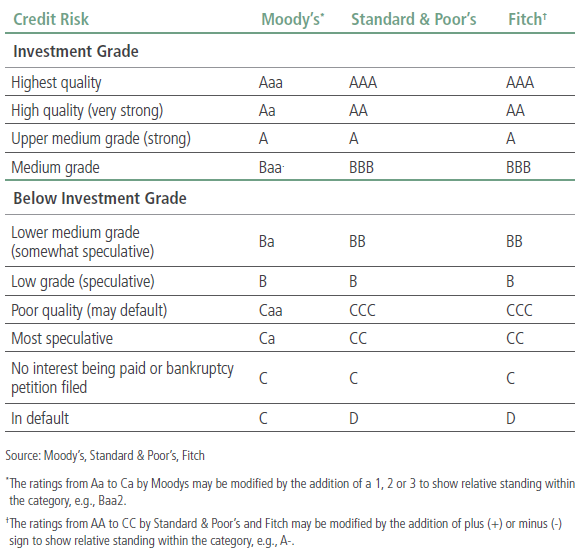 S&P, Fitch and Moody’s are credit rating agencies who rate the company’s ability to pay back debt and the likelihood of default. Because high yield bond issuers are considered speculative (refer to the Chart below). These issuers must pay higher coupons to attract investors to buy their bonds. That is where the opportunities come. Why do people invest in high yield bonds? We all know that high risk demands high return and high yield bonds offer higher coupon payout. In Singapore’s context, most high yield bonds offer a yield around 4% to 6%. What you should know is that many good Singapore companies’ bonds are “not rated”. A lot of times, it’s simply because the company doesn’t bother to spend the money to pay a rating agencies for the services. These are the bonds you should look out for. Not all the bonds are the same. High yield bonds typically have a low correlation to investment grade fixed income sectors. What does this mean to you? In a rising interest rate environment such as now, traditional bonds are badly hit. You can see that the US government bonds suffered greatly while US high yield bonds were heading towards a different direction. It means allocating high yield bonds into your portfolio helped decrease overall investment risk and improve the consistency of returns. And that is what happened to my GMC portfolio. High yield bonds and equities tend to respond in a similar way to the overall market environment, but high yield bond returns tend to be less volatile because the income part of the return is typically larger, providing an added measure of stability. What you may not know is that bondholders have priority over stockholders in a company’s capital structure in the event of bankruptcy or liquidation. So, if you are a high yield bond investor, you have a greater chance of recovering your investment than equity investors if the company really goes under. Now you think about it, if you believe a small company is worth investing because of its potential moderate growth, would it be better to invest in their high yield bonds or stocks? I will leave that to you to ponder. Are high yield bonds safe? Some people call high yield bonds “junk bond” because the rating agencies categorize them as “speculative fundamentals”. I feel this statement is too sweeping. I don’t want to go into too technical but basically non-investment grade bond companies are not necessarily bad companies. It is a trade-off between risk and return. At the same time, many so-called good quality “AAA” rated bonds such as Lehman Broker’s bond also defaulted before. High yield bond did not always exist. Until the 1980s, high yield bonds were simply the “fallen angels” – former investment-grade companies that had been downgraded below investment grade. The high yield market has since evolved, and today, much high yield debt is used for general corporate purposes, such as financing capital needs or consolidating and paying down bank lines of credit. 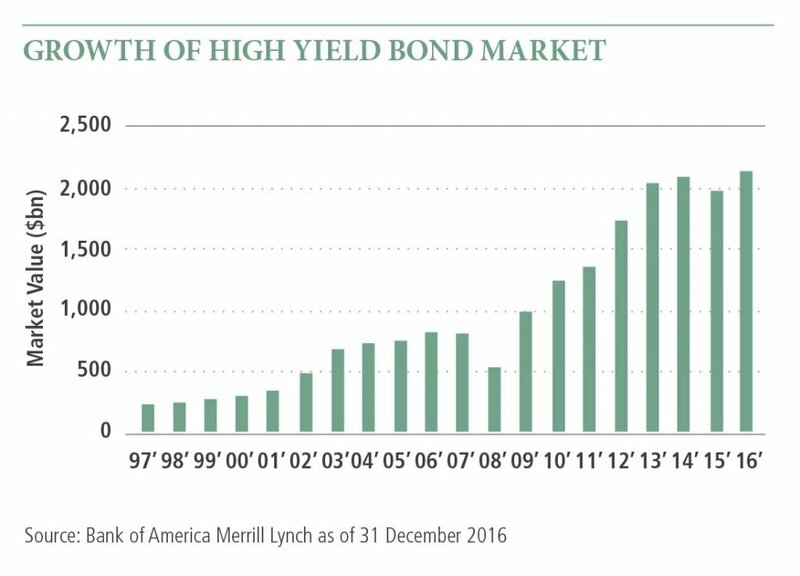 As you can see from the chart below, the high yield bond market is more than $2 trillion today. If you understand my explanation earlier, you will see that the biggest risk of high yield bond is default risk. How many high yield bonds defaulted their payments? According to research by First Trust, the bond default rate has been low since 2011 and is less than 2%. So let’s say you don’t know anything about high yield bond and you just blindly bought 100 such bonds randomly, statistically, there won’t be more than 2 bonds default. But if you only invest in one bond such as Swiber and it defaults, it could be a catastrophic event for you. Therefore, for most retail investors, it only makes sense for you to invest in a “high yield bond fund” or a “high yield bond ETF”. A high yield bond fund or ETF will typically invest in a few hundred bonds. In fact, many active high yield bond fund managers keep up a good track record of zero default rate in their funds through their rigid selection process. How should you invest in high yield bond? In Singapore, there is a very high barrier to invest in a direct bond. Most bonds need a minimum of $200,000 per transaction. The good news is (and I highly recommend) that you can invest in high yield bonds through funds. But it does not mean that high yield bond is always a good asset to own. High yield bond is very sensitive to the economic environment and the issuer’s industry outlook. In 2015, when the oil price plunged, the high yield bonds issued by energy companies were at obvious risk. To a certain extent, there were credit risks to financial institutions too. You cannot blindly buy and hold high yield bonds without constantly monitoring them. This is where you can leverage my investment management services. Do you have any question about high yield bond investment? Leave your comment below and I will try my best to answer. This is a very interesting article, well done. In Singapore, what funds does investment for high yield bonds, does a minimum investment of 5 to 10 k allows one to do so? There are quite a number of high yield bond funds. you can check via fundsupermart fund selector. How to identity a high yield bond or bond fund as overprice? Hi, John, a simple way is to look at the yield spread. i.e. the high yield bond yield comparing to a risk free bond, based on the current price. If the spread is too low, it implies the high yield bond is overpriced. 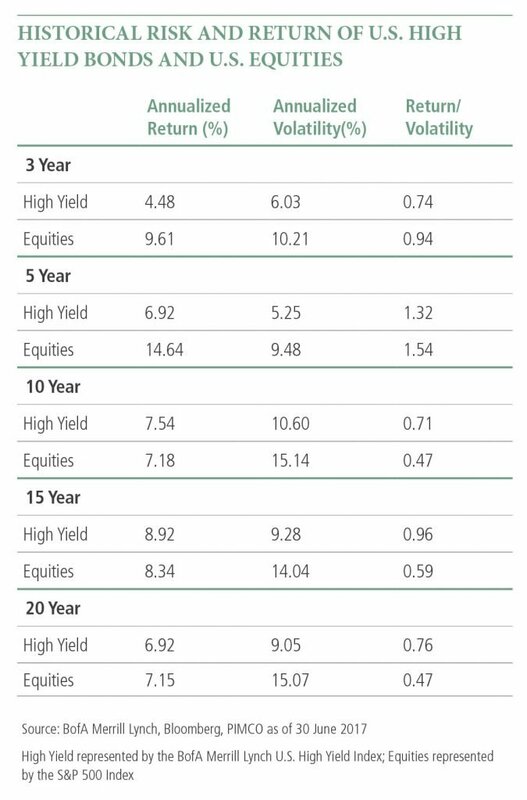 Yes, you are right, but what kind of yield are we looking at currently from a high yield bond fund and what proportion shall we hold high yield bond fund in our retirement portfolio? Hi Chiu Sang, I will expect at least 5% yield (net of fees) from a pure high yield bond fund. For the proportion of the high yield bond in your portfolio, it should be based on the market condition. If the general high yield bond market is overpriced (like now), you should reduce the allocation and vice versa.